One of the fundamental concepts in most smart home systems is the idea of "scenes" (or "programs"). Scenes allow you to create and save preset settings for one or more connected devices in your smart home. Common examples include scenes for lighting, such as "Morning" or "Evening" scenes that turn lights on and off, set dimmer levels and potentially take other actions like locking and unlocking doors, adjusting the thermostats or more. With scenes, the possibilities are only limited by number of connected smart devices in your home and your imagination. In Invisible: Controller, scenes defined on your smart home hub (or "controller") are exposed on the dashboard as tappable buttons. 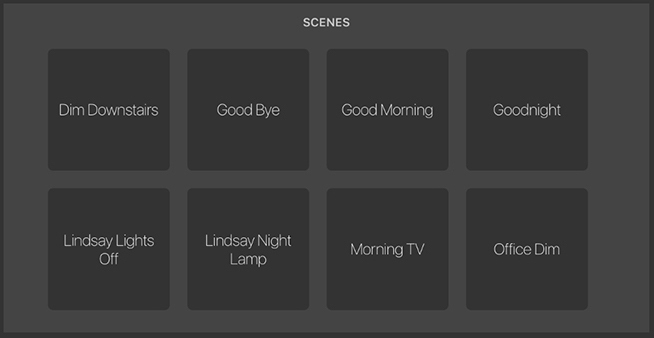 Tapping on a scene name will attempt to run that scene on hub. If the scene runs correctly, the dashboard will show "Success." If something goes wrong, the dashboard will show "Error." NOTE: Due to the way many wireless smart home devices work, some devices may not respond instantly even when a scene runs correctly. If Invisible: Controller indicates a scene has run correctly, wait a few moments for devices to respond before attempting to run the scene again. Next time you run Invisible: Controller, this scene will show-up as a button on the dashboard that allows you to manually run the scene. For additional help with Vera scenes, please refer to this Vera help article. Not all scenes are meant to be run manually. Some scenes are run on a specific schedule, while others run when another smart device triggers the scene (like a motion detector turning on lights). In these cases, you usually do not want "automatic" scenes to be displayed on Invisible: Controller. To hide "automatic" scenes from the Invisible: Controller dashboard, simply make sure the scene's name starts with "Auto". By default, Invisible: Controller will automatically hide any scene with a name that starts with "Auto". For example, if your smart home hub has a scene called "Bathroom Motion Lights," to hide it from Invisible: Controller simply rename it to "Auto Bathroom Motion Lights." Options for hiding scenes that do not require changing scene names will be available in future updates to Invisible: Controller.